In a truly “free market,” you have a right to choose the best product — free of all corporate propaganda. 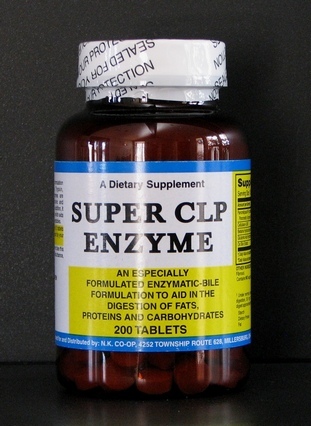 The choice of Super CLP Enzymes is the simple choice to keep your digestion healthy. Super CLP is a standardized enzymatic formulation rich in Amylase, Protease, Lipase, Trypsin, Chymotripsin and Ox Bile. These enzymes are accompanied by Glutamic Acid, Hydrochloric and Betaine Hydrochloride and aids digestion. In addition, it contains cellulase not produced in humans, which aids in digesting tough fibers found in fruits and vegetables. An important branch of twentieth-century nutritional research, has been the discovery of enzymes and their function. Enzymes make life possible. Enzymes are complex proteins charged with the life force that enters into almost every biochemical process that takes place in the body. Their activity depends on the presence of vitamins and minerals, particularly magnesium. Your digestive system, immune system, blood stream, liver, kidneys, spleen and pancreas as well as your ability to see, think, feel and breathe all depend on enzymes. It seems we inherit a certain enzyme potential at birth. Enzymes are produced most notably in the pancreas and they are present in all of the raw foods we eat. At birth, we are endowed with a certain potential for manufacturing enzymes in our bodies, an enzyme “reserve”. Nature intended that we continually replenish that reserve through proper nutrition and eating habits. Processing and cooking destroys enzymes in the food. Any sustained heat of 118 degrees F or higher destroys virtually all enzymes. This means that for most of us, the food entering our stomachs is severely enzyme deficient. The vast majority of metabolic enzymes in the body regulate everything from liver function to the immune system are proteases. Eating foods that are cooked or processed forces the body to divert it production of enzymes to break down proteins in our diets. Decreased enzyme levels are found in a number of chronic illnesses such as allergies, skin diseases, Crohn’s disease and serious diseases like diabetes, coronary artery and heart disease and cancer. Diminished food allergies due to more complete protein digestion. An increase in energy levels. Reduced inflammation. Reducing inflammation can have an immediate impact on improved heart health, cancer prevention and recovery, along with Alzheimer’s prevention. It also helps speed up recovery from sprains, strains, fractures, bruises, contusions, surgery and arthritis. Cleaning the blood of debris: Proteolytic enzymes are the primary tools the body uses to “digest” organic debris in the circulatory and lymph systems. Dissolving fibrin in the blood: Reducing the risk of clots: Certain specialized proteases are extremely effective at improving the “quality” of blood cells, optimizing the ability of blood to flow through the circulatory system and reducing the risk of clots. Maximized immune system: The primary vehicle the immune system uses for destroying invaders is enzymes. Proteolytic enzymes taken between meals go into the bloodstream and digest these invaders. Enzymes expose antigens on the surface of cancer cells, so they can be recognized as foreign and destroyed by the immune system. Circulating Immune complexes (CIC’s) produced when cancerous cells shed their antigens into the circulation to avoid detection by the immune system can be destroyed by pancreatic enzymes. Pancreatic enzymes can stimulate natural killer cells, T-cells and tumor necrosis factor. All toxic to cancer cells. Dr. Solorzano reports that by removing the “sticky” coating found on tumor cells, enzymes reduce the risk of tumors adhering to other areas of the body and allow the enzyme to enter the cancer cell during it’s reproductive phase. Vitamin A increases this effect. Large undigested proteins make their way into the bloodstream and form CIC’s out of the body thereby reducing allergies, sinutis, asthma and autoimmune conditions. Super CLP Enzymes can help reduce the symptoms of MS, clean out the lungs and aid in detoxing chemical residues along with heavy metals. In addition to enzymes being necessary for protein digestion, pretease, as well as other digestive secretions are largely responsible for keeping the small intestine free of parasites – including yeast, protozoa and intestinal worms. Pancreatic enzymes are also useful for treating bacterial overgrowth in the gastrointestinal tract which can result in protein putrification and toxic bowel syndrome. A lack of pancreatic enzymes greatly increases your risk of intestinal infection. The lipase content is decreased in human obesity. Without lipase, fat stagnates and accumulates in the arteries, capillaries and other tissues. Nutritional deficiencies resulting from malabsorption can cause food cravings and lead to overeating. 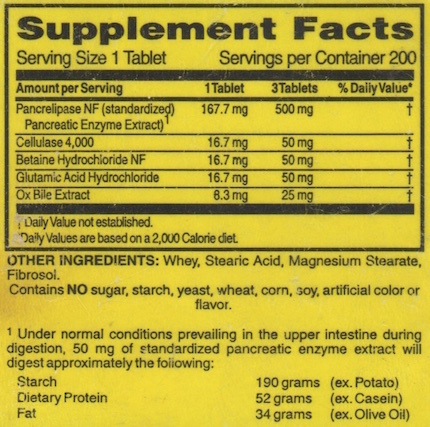 In animal studies, use of pancreatic enzymes supplements resulted in decreased food intake and a significant loss of body weight. 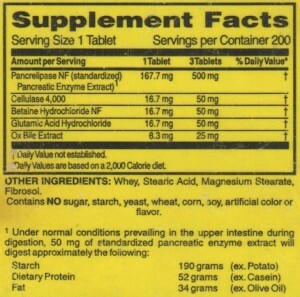 Disclaimer – The information has not been evaluated by the Food and Drug Administration and is intended for education, entertainment and informational purposes only. This information is not intended to be used to diagnose, prescribe or replace proper medical care, nor is it intended to be used to treat, diagnose, mitigate or prevent any disease.